Bharatha made adequate arrangements for encamping his great army on the banks of the mighty river Ganga and thought over the problem of bringing back Rama and took up his dwelling there. This is the end of the eighty third chapter Of the book Ayodhya of the holy Ramayana composed by Valmiki as the first epic. “Let five hundred boats each manned by hundred men be available here” , said Guha exhorting them. This is the end of the eighty fourth chapter Of the book Ayodhya of the holy Ramayana composed by Valmiki as the first epic. This is the end of the eighty fifth chapter Of the book Ayodhya of the holy Ramayana composed by Valmiki as the first epic. This is the end of the eighty sixth chapter Of the book Ayodhya of the holy Ramayana composed by Valmiki as the first epic. This is the end of the eighty seventh chapter Of the book Ayodhya of the holy Ramayana composed by Valmiki as the first epic. “That destroyer of enemies Rama used to reside in seven storied palaces and great mansions with floors paved with gold , over which carpets used to be spread. These rooms used to have bouquets of flowers of varied colours and the paste of the perfumed sandal and Agaru used to be applied there. This is the end of the eighty eighth chapter Of the book Ayodhya of the holy Ramayana composed by Valmiki as the first epic. While the lions among were talking like this, Guha came in time and , saluted them and told Bharatha. This is the end of the eighty ninth chapter Of the book Ayodhya of the holy Ramayana composed by Valmiki as the first epic. This is the end of the ninetieth chapter Of the book Ayodhya of the holy Ramayana composed by Valmiki as the first epic. On the two banks of the river , celestial and charming houses appeared by the grace of Lord Brahma. Shining in gold ornaments , gems , corals and pearls twenty thousand women sent by Khubera came. Those soldiers danced , laughed as well as sang and ran about all over wearing thousands of garlands. This is the end of the ninety first chapter Of the book Ayodhya of the holy Ramayana composed by Valmiki as the first epic. Bharatha after saluting him , went round him and summoned the army and ordered them to get ready. This is the end of the ninety second chapter Of the book Ayodhya of the holy Ramayana composed by Valmiki as the first epic. 93.Bharatha reaches Chithrakuta and spots the hermitage of Rama. Hearing the words men well armed entered that forest and those people noticed a smoke there. This is the end of the ninety third chapter Of the book Ayodhya of the holy Ramayana composed by Valmiki as the first epic. After that Rama who resembled the devas and who loved the forests and mountains, having lived in that mountain for quite a long time , with a desire to make Sita happy as well as to please himself started showing the wonderful Chithrakuta mountains to her like Indra did to Sachi devi. This is the end of the ninety fourth chapter Of the book Ayodhya of the holy Ramayana composed by Valmiki as the first epic. “Oh pretty Sita, you may enter the river Mandakini with red lotuses and white lotuses submerged in it . This is the end of the ninety fifth chapter Of the book Ayodhya of the holy Ramayana composed by Valmiki as the first epic. 96. Rama hears the sound in the forest , Lakshmana sees Bharatha ’s and is agitated. When they were sitting like this, the sound and dust raised by the approaching army reached the sky. This is the end of the ninety sixth chapter Of the book Ayodhya of the holy Ramayana composed by Valmiki as the first epic. This is the end of the ninety seventh chapter Of the book Ayodhya of the holy Ramayana composed by Valmiki as the first epic. This is the end of the ninety eighth chapter Of the book Ayodhya of the holy Ramayana composed by Valmiki as the first epic. Sumanthra who was also impatient to see Rama like Bharatha , followed Shatrugna not far behind . In front of the hut Bharatha saw chopped logs of wood as well as flowers which have been plucked. This is the end of the ninety ninth chapter Of the book Ayodhya of the holy Ramayana composed by Valmiki as the first epic. 100.Rama enquires about ruling of kingdom of Ayodhya. 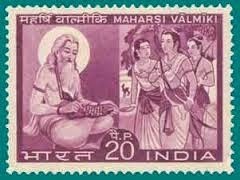 This is the end of the hundredth chapter Of the book Ayodhya of the holy Ramayana composed by Valmiki as the first epic. This is the end of the hundred and one chapter Of the book Ayodhya of the holy Ramayana composed by Valmiki as the first epic. The wailing of the brothers mingled with that of Vaidehi echoed in the forest like the roar of a lion. All of them , then left their camps and ran towards that sound with only a single thought in their mind. Frightened by the sound, birds filled up the sky and people covered the earth and both of them shined. This is the end of the hundred and second chapter Of the book Ayodhya of the holy Ramayana composed by Valmiki as the first epic. The wives of Dasaratha followed by sage Vasishta on foot with an intense desire to see Rama. Kausalya who was an emaciated face with eyes full of tears addressing Sumithra and other wives told. This is the end of the hundred and third chapter Of the book Ayodhya of the holy Ramayana composed by Valmiki as the first epic. This is the end of the hundred and fourth chapter Of the book Ayodhya of the holy Ramayana composed by Valmiki as the first epic. When those lion among men were lamenting among their friends, the night passed off painfully. This is the end of the hundred and fifth chapter Of the book Ayodhya of the holy Ramayana composed by Valmiki as the first epic. Seeing the great determination of Rama , the people assembled there with both happy and sad..They were sad because he was not returning to Ayodhya and happy because he was greatly determined. This is the end of the hundred and sixth chapter Of the book Ayodhya of the holy Ramayana composed by Valmiki as the first epic. This is the end of the hundred and seventh chapter Of the book Ayodhya of the holy Ramayana composed by Valmiki as the first epic. 108.Jabali the minister who is an atheist tries to reason with Rama. This is the end of the hundred and eighth chapter Of the book Ayodhya of the holy Ramayana composed by Valmiki as the first epic. 109.Rama denies Jabali ‘s opinion. This is the end of the hundred and ninth chapter Of the book Ayodhya of the holy Ramayana composed by Valmiki as the first epic. This is the end of the hundred and tenth chapter Of the book Ayodhya of the holy Ramayana composed by Valmiki as the first epic. 111.Rama agrees to become king after he comes back. This is the end of the hundred and eleventh chapter Of the book Ayodhya of the holy Ramayana composed by Valmiki as the first epic. 112. Rama refuses the kingdom and Bharatha requests for his sandals. Due to great sorrow and due to their throats being choked with tears, the mothers of Rama could not take leave from him but Rama after saluting all of them entered in o his hut with eyes full of tears. This is the end of the hundred and twelfth chapter Of the book Ayodhya of the holy Ramayana composed by Valmiki as the first epic. Bharatha along with his relations and army crossed the river Ganga filled completely with clear and pure water, , entered the town of Sringaberipura and from that city beheld the town of Ayodhya. This is the end of the hundred and thirteenth chapter Of the book Ayodhya of the holy Ramayana composed by Valmiki as the first epic. This is the end of the hundred and fourteenth chapter Of the book Ayodhya of the holy Ramayana composed by Valmiki as the first epic. 115.Rama’s sandals are consecrated as king in Nandigrama. Along with their gurus, Vasishta and Brahmins they proceeded east wards towards Nandigrama . This is the end of the hundred and fifteenth chapter Of the book Ayodhya of the holy Ramayana composed by Valmiki as the first epic. 116. The sages of Chithrakuta decide to leave Chithrakuta. This is the end of the hundred and sixteenth chapter Of the book Ayodhya of the holy Ramayana composed by Valmiki as the first epic. This is the end of the hundred and seventeenth chapter Of the book Ayodhya of the holy Ramayana composed by Valmiki as the first epic. 118.Sita talks top Anasuya and tells the account of her Swayamvara. This is the end of the hundred and eighteenth chapter Of the book Ayodhya of the holy Ramayana composed by Valmiki as the first epic. Then those sages saluted Rama and they blessed the slayer of enemies Rama, for a safe journey and after that Rama entered the forest like a sun entering the cloud along with his wife and Lakshmana. This is the end of the hundred and nineteenth chapter Of the book Ayodhya of the holy Ramayana composed by Valmiki as the first epic.